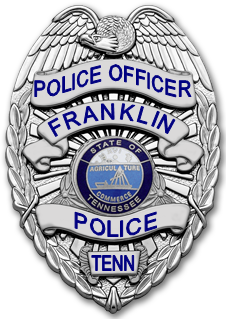 At 2:30pm, Thursday, January 12, Chief Deborah Faulkner will swear-in and personally present Franklin Police badges to the Department’s newest officers: Officer Anthony Alexander, Officer Chanthama Chittanavong, Officer Jonathan Corner, Officer Prentice Griffin, Officer Connor Jimenez, Officer Branden McClellan, Officer Rebecca Pike, Officer Cody Walter, and Officer Robert Wombles. The formal ceremony is being held at Rolling Hills Community Church, 1810 Columbia Avenue. The public is invited to attend this one-hour ceremony, as we celebrate the certification of these nine officers to serve as Tennessee police officers, and welcome them as they join Franklin’s Finest in service to our community.